Presenting Let's Eat Raven and other Doujinshi Short Stories by Nagumo, Aji-Ichi. Doujinshi, otherwise known as independent manga in Japan, is rarely published in English. In fact, it's considered underground and quite exclusive in its home country of Japan as well. 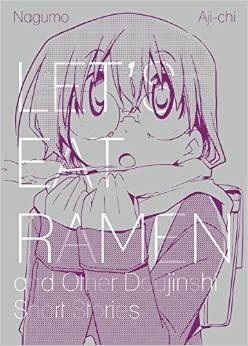 Let's Eat Ramen and Other Doujinshi Short Stories finally gives western readers an exclusive look at the elusive world of contemporary Japanese doujinshi manga. Let's East Ramen is a three-part tale of Saeki, a girl who loves ramen noodles. At last, she thinks that she has finally found the perfect ramen shop, but the problem is the shop is completely full of old regulars and she can't get in. Will the timid Saeki ever summon the willpower to reach out and get the ramen that she desperately wants? A manga about eating Ramen. Yes you heard it this manga is basically about eating Ramen as the title suggests. While I love reading manga, but I have only had the chance to read some of them till now and they are mostly the ones whose anime i had seen. That being said "Doujinshi" is a relatively new field for me. The term basically alludes to what you would call indie-manga and much more exclusive to Japan. 'Let's Eat Ramen and other Doujinshi short stories' consists of 4 stories. The titular story is a 3 part part of a girl, Saeki who fantasizes about eating Ramen at this famous joint but can't gather the courage to enter because the customers there are all men. So she gets a male classmate of her's to go with and eventually on succeeding tasting outings as well. Really these stories are more of a modern contemporary teen romance ...... and so subtitle too. The other three are all lesbian teen stories about a girl wooing another when the result reveals her true self, another heartbroken about her girlfriend leaving her for a boy and the last about a girl intimidated but another girl because she read books without pictures *wink*. Nothing too graphic, all the stories put their points across in the most common approach. The art and the plots of Nagumo and Aji-Ichi are not exclusive but more simple and very very subtle and quite literally very innocent. Reads like the regular manga in right to left and counter-clockwise fashion. Not a must read but is more deserving of a once look-through. "Light manga for light reading"